Here’s a cracking little yarn from Dean Saunders about the time Brian Clough attempted to prise him away from Derby County in the summer of 1991. 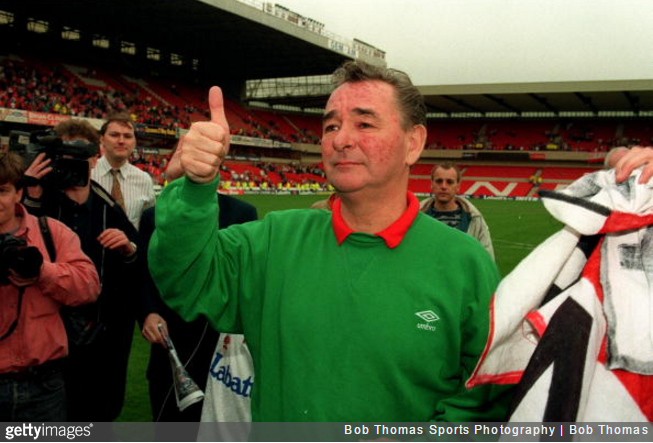 Saunders was hot property having scored 17 goals despite Derby’s relegation from the top-tier, with Everton and Cloughie’s Forest forming an orderly queue in hope of snaring the prolific Welsh striker. After meeting with Everton in the morning, Saunders and his Robbie Coltrane-lookalike agent arranged to meet with Clough (and ace negotiator Archie Gemmill) at the house of Forest scout Alan Hill on the outskirts of Nottingham. While Saunders’ anecdote is certainly entertaining (the punchline is a corker), it’ll no doubt be tinged with an air of melancholy for most Forest fans, who will know that Clough’s chronic drinking had very much got the better of him by that point. Bittersweet, you might say – a word which seems incredibly fitting when talking about Clough the man. For the record, Saunders did eventually sign for Forest but not until 1996/97, by which time he was a bit of a fading force.